The Partnership for Better Health is a well-respected voice on timely health issues and actively involved in various initiatives and events throughout the community. Whether we are weighing in on a pressing policy issue, sharing recent developments in the field of health care or spreading the news about a promising public health strategy, we aim to keep the community informed and engaged. Browse recent news items below to see what’s happening, and stay informed by signing up to receive future communications directly in your inbox. Posted June 15th, 2016 . June 2, 2016 – On Tuesday, May 31st the Partnership for Better Health announced their 2016 Champions for Better Health Awards at a community celebration held at Dickinson College. The awards recognize distinguished community volunteers, health professionals, business leaders, philanthropists and youth whose efforts play a vital role in advancing the health and wellness of our region. Jeff Gayman, Board Chair at the Partnership, welcomed the more than 140 attendees and congratulated award winners for their outstanding accomplishments. “We have supported some of the amazing organizations represented here tonight, and your excellence is what creates our healthy community,” Gayman said. A total of 18 finalists were selected for recognition by the Partnership. Winners and honorable mentions were announced across six categories: community volunteer; youth; nonprofit; professional; and business. A special lifetime achievement award was given to Dr. Harold Kretzing in recognition of his long-standing commitment to community health. Dr. Kretzing worked as a family physician in Carlisle, served as a school and sports physician for Carlisle Area School District and has volunteered countless hours providing care to patients at Sadler Health Center. Collectively, winners received $2500 in prizes from the Partnership to contribute to local health charities of their choice. As the winner of a grand prize drawing, the Law Offices of Saidis, Sullivan & Rogers won $1300, which they plan to donate to a health charity. Cumberland Valley Rails-To-Trails Council- The Council is an all-volunteer nonprofit organization that built and maintains the Cumberland Valley Rail Trail. The trial currently runs from Shippensburg to Newville, and plans are underway to expand the trail to Carlisle. All trail maintenance, development, grant writing and promotions are accomplished by volunteers. NHS Stevens Center’s Comprehensive Clinical Team and Drug and Alcohol Program have lead the way in psychiatric services and drug and alcohol outpatient treatment for Cumberland and Perry Counties. The Comprehensive Team targets individuals with chronic and persistent mental illness who are under- or uninsured. The Drug and Alcohol Program treats an estimated 200 clients each year, who are also under- or uninsured. American Trauma Society- The Trauma Society’s Pennsylvania Division is fully committed to reducing traumatic injuries and deaths through preventive education. They are on the leading edge with the development of new trauma prevention— with initiatives that target everything from bike helmet usage and concussion prevention, to Plain Community initiatives, secondary drownings and home safety. The Civic Club of Shippensburg provides, free of charge, a registered nurse for non-skilled services not covered by insurance plans for those over 18. These services are funded with the help of fund raisers, Court House tours, bequests and donations from various organizations. 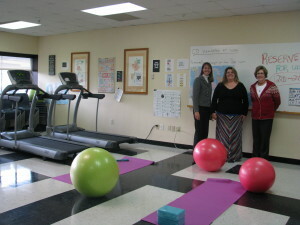 Dickinson College’s employee wellness program began in 2006 to create a culture of wellbeing for their employees. Dickinson has partnered with the Carlisle UMedGym to offer a unique program—individual guidance for those with specific health needs while reducing health risks and increasing overall wellbeing. Samantha Nenninger – Samantha is a survivor of the #1 complication of childbirth: postpartum depression. As co-facilitator of Carlisle Regional Medical Center’s HOPE mom’s group, she is using her experience to help other mothers. Through inspirational texts, outreach though social media, and responding to phone calls at all hours, Samantha has become a trusted friend and advocate of new moms who are struggling. Kim Bailey – Kim created the PAW Packs Program for the Big Spring School District. This program provides packages of food for weekends, holidays and vacations to eligible children who otherwise would not have enough to eat. The Law Offices of Saidis, Sullivan and Rogers – This team of enthusiastic employees developed a dynamic wellness at work program for their office. They shared health materials and hosted staff competitions to incentivize healthy behaviors like walking, drinking more water and taking the stairs. Together, their staff virtually walked the Macy’s Day Parade, the beaches of Hawaii and all the way to Aspen, Colorado. Jack Carroll – Government Leader of the Year. Jack is executive director of the Cumberland-Perry Drug & Alcohol Commission. He has been a tireless advocate for drug and alcohol treatment and prevention resources to meet the needs of local residents. As the opiate epidemic has escalated in recent years, Jack is playing a pivotal role in educating the community about the crisis and he is working to expand treatment options through collaboration with many others. Camille Baughman – Wellness Professional of the Year. As a licensed massage therapist, Camille has been promoting healthy lifestyles in the community for 30 years. She has co-developed local programs like the YWCA’s Partners in Wellness and Harrisburg Area Community College’s massage therapy program. She has given her leadership to professional groups by serving on the Boards of the Pennsylvania Massage Therapy Licensing Board, the YWCA, and the Cumberland County Drug & Alcohol Commission. Camille has also given generously of her time to important youth serving programs, like Camp Koala and Randi’s Camp. Dr. Roderick Frazier – Public Health Professional of the Year. After retiring as a dentist with the United States military, Dr. Frazier decided he was ready to do more. He joined Sadler Health Center to provide quality dental care to under- and uninsured patients of all ages. Now with Sadler for 15 years, he has served thousands of patients. In his free time, he has volunteered for local groups, like the Rotary Club of Carlisle and the Employment Skills Center. Dr. Holly Hoffman – Medical Professional of the Year. For Dr. Hoffman, a dedicated practicing pediatrician, superior health care for children in Carlisle has always been her goal. Dr. Hoffman chairs the Department of Pediatrics at Carlisle Regional Medical Center. As a proponent of the patient centered medical home, she led the way for Carlisle Pediatric Associates to become certified. A long-standing medical volunteer, Dr. Hoffman has given her time and expertise to Sadler Health Center, Living Water Dental Health Ministry and Christ Lutheran Prenatal Clinic. She has led medical mission trips to Kenya and served as a Girl Scout leader for 13 years. Dr. Tina Collins – As a hospitalist at Carlisle Regional Medical Center, Dr. Collins consistently goes above and beyond in caring for her patients. When they are lonely and depressed, she is at their bedside to provide comfort, understanding and pampering. Dr. Collins visits with patients on her days off and quietly provides financial support, clothing and food to patients in need. Dr. Chavone Momon-Nelson – Joining the Carlisle community in 2014 as a partnering physician at Carlisle OB/GYN, Dr. Momon-Nelson hit the ground running. She has made it her mission to provide outstanding care to local patients and she is very active in the community. Dr. Nelson opened a satellite office in Shippensburg. Janelle French – As a certified nutrition coach, Janelle founded Genesis Health Journeys to educate community members about the benefits of whole foods and active lifestyles. In her role as a coach, Janelle has helped people regain health through a nutritious diet and lifestyle changes that incorporate exercise into daily living. Sadler’s Nurse Family Partnership – The mission of Sadler’s Nurse-Family Partnership is to empower mothers living in poverty to successfully change their lives and the lives of their children through evidence-based home visits from a caring nurse. Impressive program outcomes include improved prenatal health, fewer childhood injuries, fewer subsequent pregnancies, increases in maternal employment and improved school readiness. Sadler’s dedicated nurse team will serve 115 families next year, living in Cumberland and Perry Counties. LEAF – Leadership, Education and Farming is a unique method for effecting change in the way our community relates to food. LEAF trains youth to be change agents in their own communities. Each year, LEAF hires a cohort of young interns between the ages of 14 and 22, and engages them in growing fresh produce, in learning to cook the food they raise, and in educating the community about nutrition. The Partnership for Better Health is pleased to offer a scholarship for the 2016-17 Leadership Cumberland program. The award will go to a health care related professional working at or volunteering for a nonprofit organization that serves the foundation’s region. To apply, Leadership Cumberland Scholarship App 2015-2016 . Applications are due by June 10. To learn more, contact Gail Witwer at: 960-9009 x 8 or gwitwer@ForBetterHealthPA.org. Posted January 7th, 2016 . “With more and more adults spending long hours in jobs that lack natural mobility, integrating health strategies directly into the work environment has become essential to employee health, morale and productivity.” Read how Wellness @ Work is making a difference at one Carlisle company, CampusDoor. Posted October 21st, 2015 . Effective leaders express a compelling story about their work that builds public awareness and motivates people to support their causes. Explore teamwork practices in nonprofit organizations. Discover your unique leadership qualities and ways to foster passion for the mission and vision of your community benefit organization. Session registration fee is $20. or call 960-9009 x 7. Special thanks to our Premier Sponsor M&T Bank. Thanks to the United Way of Carlisle & Cumberland County and the Greater Carlisle Area Chamber of Commerce for promoting this series. Posted October 1st, 2014 . A coalition of local health advocates is working together to address health needs in Perry County and seeks community members’ support. A new health survey launched this week asks for residents’ recommendations on ways to improve county health services. The survey takes just 5 to 10 minutes to complete and is available here. In response to growing concerns about the health of Perry County residents, a new Perry County Health Coalition was formed last year. Chaired by Commissioner Brenda Benner, the coalition is comprised of representatives from the Perry Family Services Partnership Board, county government, local and regional health care providers, funders and area school systems. “I would urge all county residents to please complete the short survey,” said Commissioner Brenda Benner. “This is an impressive new undertaking and we’d like to hear from everyone in the county. The results of the study will help to mobilize improvements in the kinds of health choices, options and resources that community members can access in the future,” Benner added. The study is lead by Dr. Dave Sarcone and a research team from Dickinson College and Shippensburg University. Funders of the project include Carlisle Regional Medical Center, Highmark Blue Shield, Holy Spirit Health System, Partnership for Better Health and United Way of the Capital Region. To access a copy of the community survey, Perry County residents can visit local public offices and health businesses or it can be accessed online: www.perryco.org/Pages/default.aspx. Residents who complete the survey will be entered to win a $100 gift certificate to a grocery store of your choice.